I am not sure what happened to me, but I just found out that I haven’t been writing my blog for few months already! I’ve been so busy with many things for the last few months, and our helper just left us 2 weeks ago, that is definitely not helping! 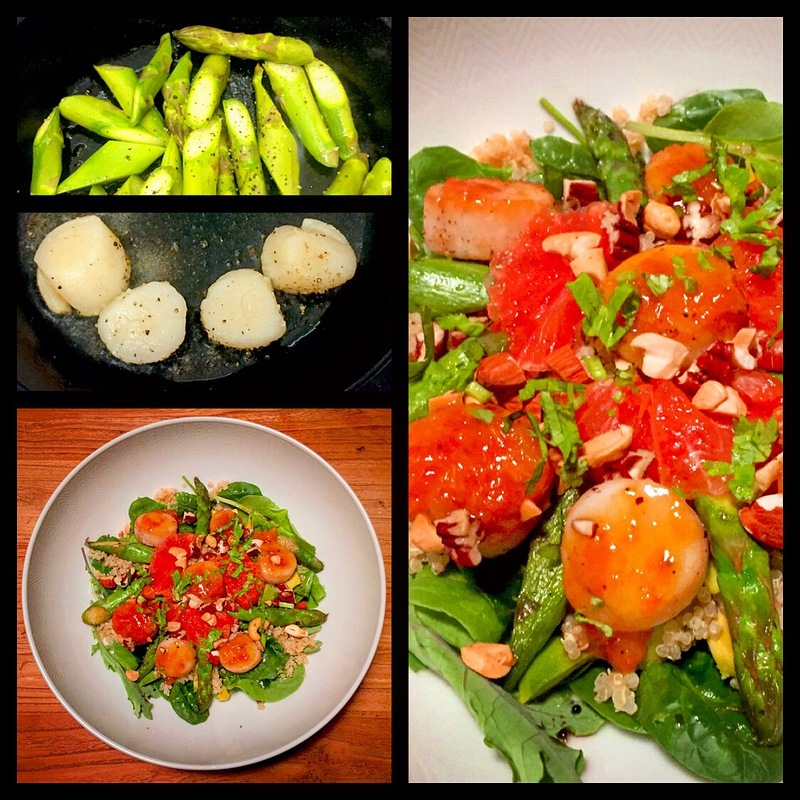 I still keep taking pictures of what I’ve cooked, and posted it on instagram. I just did not manage to write it down here! Tonight I’ve cooked a very nice dish, so I remind myself to write it down before I forgot. Tonight I cooked some chicken wings with butternut squash to go with salad, I really love the combination and the taste, really would love to share this with all of you! First of all, we need to marinate the chicken wings for at least 30 minutes. For marination, put olive oil, mustard, salt, black pepper, thyme, lemon peel, sesame seeds and some lemon juice in a bowl, mix them well and then put all chicken wings inside and let them sit there. Now, we can work on the butternut squash, remove the skin and seeds, then cut into medium cubes. Heat up the pan with some butter, fry the butternut squash until they turn soft and slightly brown, season them with some salt and pepper. Set them aside for later use. For the chicken wings, you can put them in the oven, but I decided to fry them. Heat up the pan with some oil, put some minced garlic, then fry the chicken wings until they turn golden brown with crispy skin. It was Boxing Day, OMG, so long time ago! I am also forgetting what did I cook or how I made it??? I will try my very best to remember! We were having home party at one of my friend’s home, each of us had to cook or bring one dish. So, I decided to cook a salad and a main course with meat for the two of us to bring over there. I would like to make a salad which is more Christmassy, so I am playing with the red and green colours and using pomegranate as a touch of gem. The ingredients for the salad are, baby spinach, red apple and green apple that cut in cubes, toasted pecan and mixed nuts and the final touch with pomegranate. For the apples, either you can cut them with ceramic knife to keep them nicely in their colour, or you can spill them with a splash of lemon juice, in order to keep them out of rust. For the dressing, mix olive oil, mustard, honey, lemon juice, black sesame seeds, touch of sesame oil, pinch of salt and black pepper, in a glass bottle and shake them well, mix the dressing with the salad right before serving. For the pork, go to get a nice piece of pork fillet tenderloin. 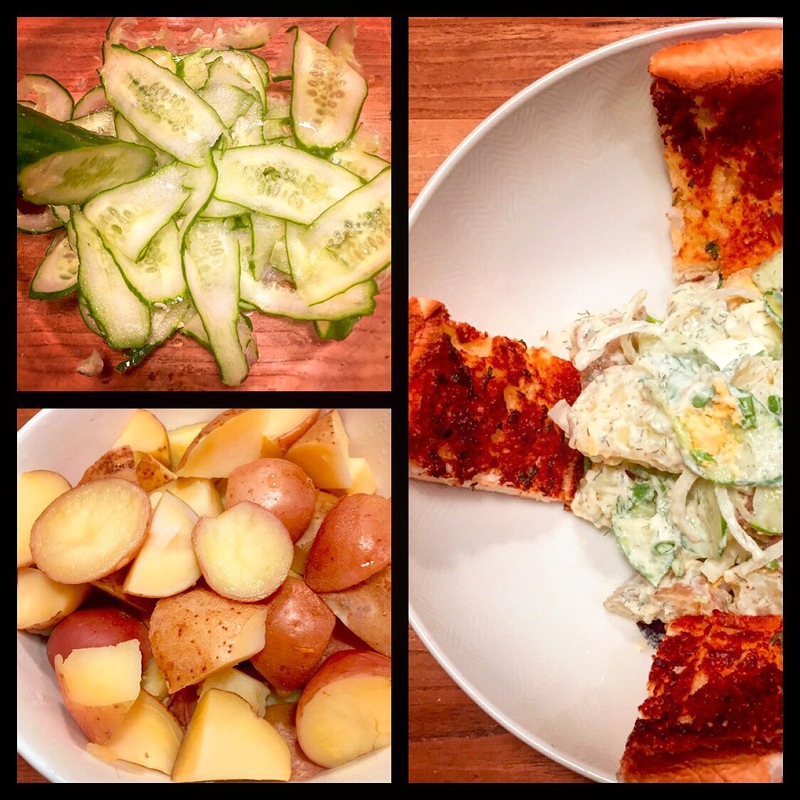 I get this recipe from Jamie Oliver, it is super simple with 5 ingredients, but I twisted it a bit. First of all, we need to get those potatoes ready, peel them and then boil them in hot water for about 15 to 20 minutes until they turned soft. Meanwhile, we can work on the pork tenderloin, season it with some salt and pepper, and then heat up the pan with some olive oil, and sear the porkloin for about 3 minutes, or until the entire surface is brown. Switch off the fire, remove the pork and quickly fry some rosemary, remove and set aside. Now, we can work on the potatoes, smash them and season with salt and pepper, add a touch of olive oil, a touch of water, and some parmesan cheese. Mix them well and then place the mashed potato in a baking tray, now place the piece of porkloin in the middle and pour the pork juice on top. Add some grated cheese on top of the potatoes, not on the pork. Place that in oven and grill for around 10 minutes under 230C. For the last touch, add some prosciutto around the porkloin by tucking them in-between the pork and the potato. Add the rosemary around, on top of the potato. Put the tray back in the oven for the last few minutes, cut the pork in slices and serve with mash potatoes. My husband loves ribs, it’s been a while that I cook ribs for him, maybe it’s about time. This time I am thinking to cook the ribs with mustard and honey flavour. I’m going to cook a lot of ribs to make sure we have some leftover for Monday lunch as well, so I cooked 3 packs of ribs. Let’s work on the sauce, mix mustard, balsamic vinegar, honey, salt and pepper, with some olive oil, taste and adjust. Then, marinate the spare ribs with the sauce for at least 10 to 15 minutes. Place ribs in a large tray, then put also striped onion and some potatoes to mix them well together, and add some fresh oregano in the tray for flavour. Place the tray inside the oven under 210C and bake them for 75 minutes, flip them every 15 minutes to avoid burning. 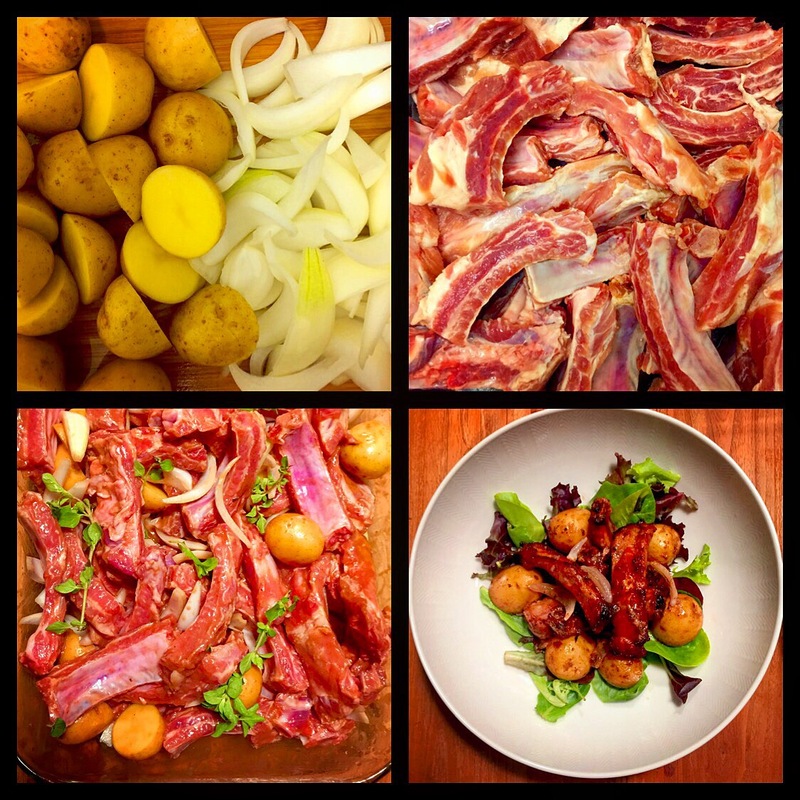 When the spare ribs are done, serve them with some salad and the potatoes. I had this gathering at home last Saturday and my friends would love to have French food. I’ve already made up my mind for the main course, I am going to cook Coq Au Vin which I did the other time and was really good. For the appetizer, I really want to do the devilled eggs, and will be great to have a salad as well. So, I was thinking…… Instead of serving two separated dishes, maybe it’s good to combine the two. Looking into traditional French salad, frisée aux lardons is one of the common one and they used to serve this with poached eggs. I’m thinking maybe I can replace the poached eggs with devilled eggs. Why not? To get the devilled eggs ready, first of all, you have to cook 6 hard boiled eggs. To make sure everything turns out fine, it will be better to have some buffer. So we cooked 8 eggs with 2 eggs buffer, in case something goes wrong, we still have enough eggs to serve all guests. When all eggs are ready, quickly put eggs into cold water with ice cubes, this procedure helps to separate the egg from the shell. You will have a nicely peeled egg later on by doing so. Let the eggs sit there for few minutes, then remove the egg shell with running water, you will have a perfectly peeled hard boil egg. When all the eggs are done, cut them in half and remove the egg yolk. Place all egg yolks in a large bowl, smashed them with a fork, then mixed them with mayonnaise, mustard, and season them with salt and pepper, mix until it turned into a smooth paste. Put the paste into a pastry bag and fill them back into each egg nicely. Garnish them with ground paprika and some chopped chives. For the Frisée Aux Lardons, it’s basically a warm salad. Heat up the pan with some olive oil and a bit of butter, fry the lardons under they turn brown. Then add some finely chopped shallots, and some red wine vinegar in the pan and bring it to boil. Let it simmer until the vinegar reduce one third, taste the sauce and season with a touch of salt and vinegar. 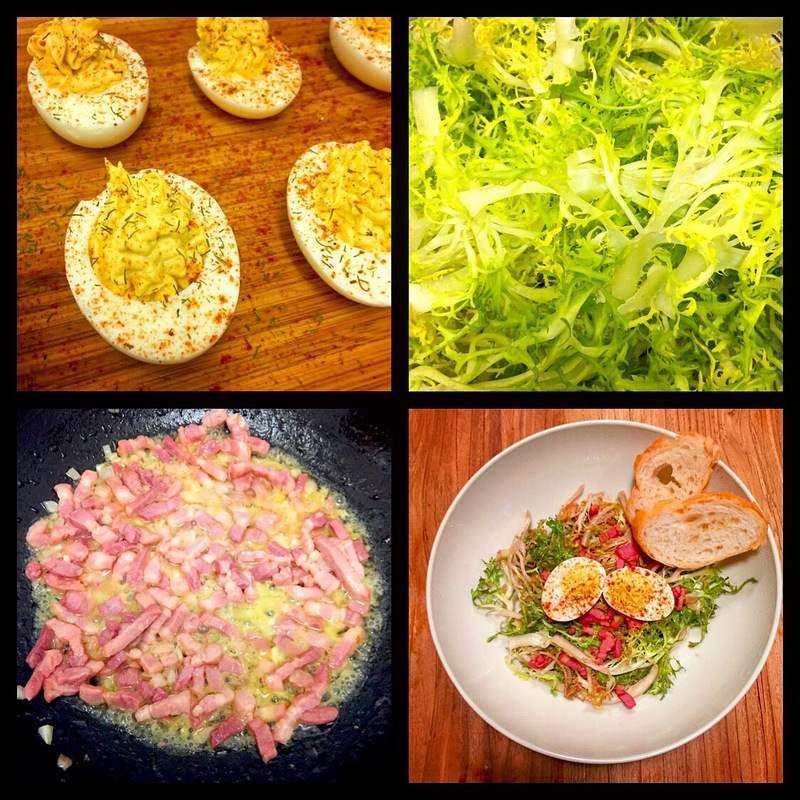 Switch off the heat and mix in the frisée salad and some chives, serve the salad with the devilled eggs. They totally go well together, and I think it’s a nice option instead of serving with poached eggs.